50 Cent sure got a lot of attention when he said he’d be OK if his son Marquise Jackson got hurt in an accident. “If both these little n—– got hit by a bus, I wouldn’t have a bad day,” 50 wrote last week. He made that comment next to a photo of Marquise and Kyle McGriff, the son of ’80s New York drug kingpin Kenneth “Supreme” McGriff, whom 50 has beefed with for years. Marquise hasn’t responded to his father’s post yet, but Kyle has, and he did it with subtlety. While brushing his teeth, he played 50’s 2003 cut “Many Men,” where the rapper talked about being shot several times in his Queens neighborhood. The song also starts with the sound of gun fire and 50 being stuck. Kyle didn’t mention the rapper’s name in the post but based on the song he chose, which is about Fif nearly being murdered, many took it as a huge diss. They also told Kyle he should leave the G-Unit boss alone or else. “You asking for smoke from the wrong dude,” one person warned. But another said 50 won’t touch Kyle based on his father’s reputation. Kyle also took another shot at 50. 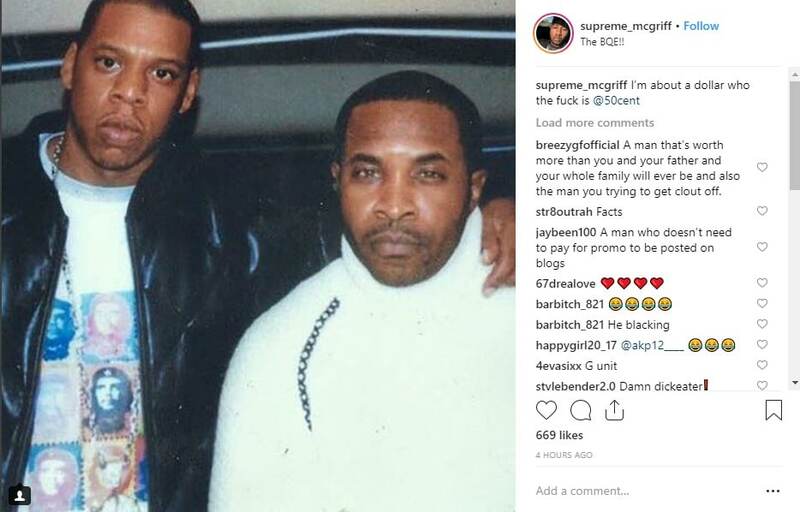 On Tuesday, he posted a photo of his father posing with Jay-Z and used a line of Jigga’s from when he was beefing with the “Many Men” creator. “I’m about a dollar who the f— is @50 cent,” wrote Kyle, also tagging Fif. You can see Kyle’s video responding to 50 below.